Hey guys! I have another manicure to share with you today, & then include a spin off ! 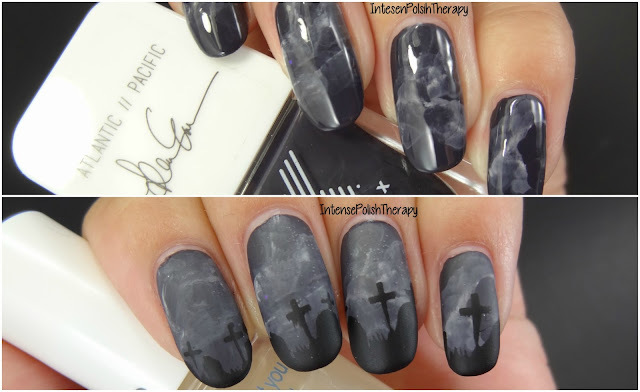 To create this look I actually just followed Chalkboard Nails tutorial, she also has a video on the tutorial. I would recommend watching Chalkboard nails video, it's extremely helpful & you can use any colours that you'd like! For this manicure I used Formula X - Taken By Storm as the base colour & then I used Ceramic Glaze - Pure for the smoke. As well as some acetone & a nail art brush & applied a quick dry top coat! & then you can switch it up by adding a matte top coat. I personally prefer it with the matte top coat.